Can you believe that Freshly Picked was kind enough to send us a pair of their moccasins for review? The Heirloom Limited Edition Moccasins to be exact!! Let me tell you, they do not disappoint!! These moccasins are perfect for my daughter. Isabella isn’t walking on her own just yet but she does get around by pushing her cart everywhere and also by holding hands, couches or basically anything she can grab to help keep her balanced. We have hardwood floors in our home and my husband always worries about her feet getting cold and I worry about them getting dirty (this girl still gets silly and puts her toes in her mouth sometimes). Since she refuses to keep socks on anymore its been an absolute struggle. This is where the moccasins come into play. Pure genius if you ask me. 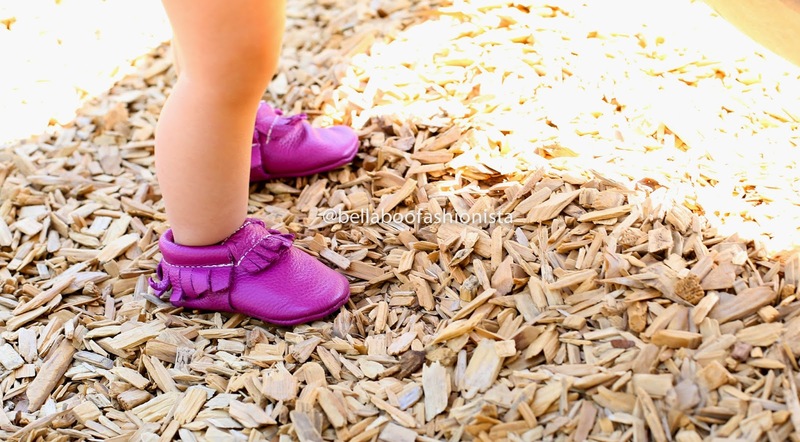 These moccasins are made of a great lightweight leather (100% genuine leather) that provide the flexibility that a baby/toddler needs while learning to walk. They do not fall off! This is huge for me. As I said earlier, Isabella has TONS of shoes and they ALL fall off so much that I end up throwing her shoes in the diaper bag. I would so much rather show off the shoes that I’m spending my money on! If I were to do the math on all the “cheap” shoes I have bought for Isabella that she does not wear for this reason I could easily have purchased a couple of pairs of moccasins! They are super easy to slip on and off of Isabella’s feet. 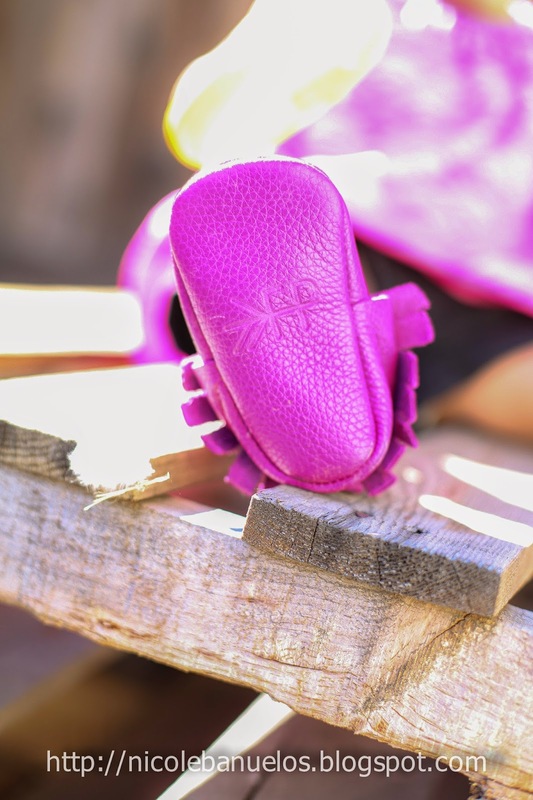 Even with their light weight soft soles, they provide protection to your little babe’s feet from outside elements such as hot pavement, sticks and stones. Durability. The leather provides great protection to keep these moccasins in tip top shape. 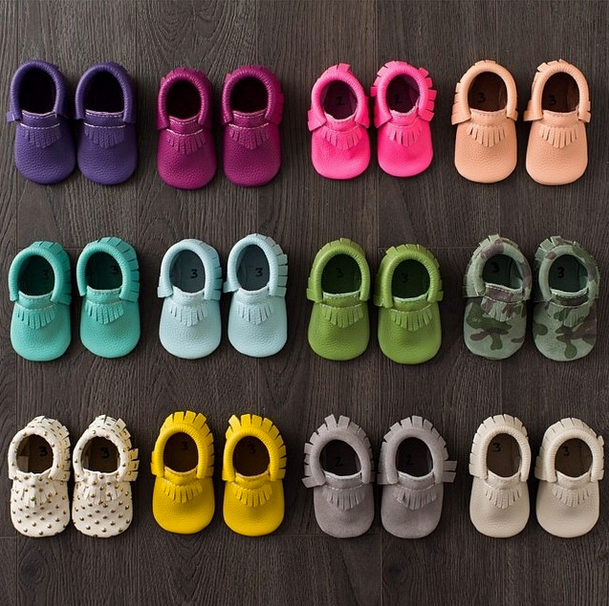 They will eventually begin to show some wear, especially if your baby is outdoors often or still a crawler and dragging their feet on the floor – but that is to be expected with any shoe. One thing I would like to add – the Heirloom Limited Edition Moccasins do seem to be much thinner than the solid color moccasins that we have and I do believe that is why they are only offered up to a size 3. They ship fast!! Although these moccasins are made to order, they ship surprisingly fast. I have ordered 4 pairs as of now and after reading the F.A.Q.’s section of Freshly Picked’s website I was not expecting to receive anything until after the 2 week mark. Within a weeks time of placing my order I received my email notification letting me know that they had shipped. Fast shipping is always a plus in my book! They are made in the USA!! So now that we have cleared that up, let me tell you the best part about Freshly Picked – the color and print variety is AWESOME! This is just a teaser of some of the options Freshly Picked has to choose from. (I can’t wait to get my hands on the Aruba moccs which are currently sold out) They have a large variety of colors/prints (30 at this time) to choose from. They also have a great sizing chart to instruct you how to order a pair for your child. You can find the chart by clicking here. I advise you not to do it when you are exhausted out of your mind like I did. I ordered two pairs, the first one size too big and the second two sizes too big. I decided to keep them anyway because I know that Isabella will be growing quickly and it will be nice to have a pair already ready for her but if any of you out there are deliriously measuring (like me) and do want to return or exchange for a correct size, Freshly Picked has an easy return/exchange policy. As you can see by now, I have nothing but great things to say about Freshly Picked Moccasins. They are so adorable and look so stinking cute on. I love to see Isabella’s little calves sticking out of them. Believe it or not, Isabella lights up when I pull her moccasins out. Its the sweetest thing to see that smile. Here are a few personal pictures showing off how we style Isabella with her moccs and also a little peak of the creative packaging that they arrive to you in! 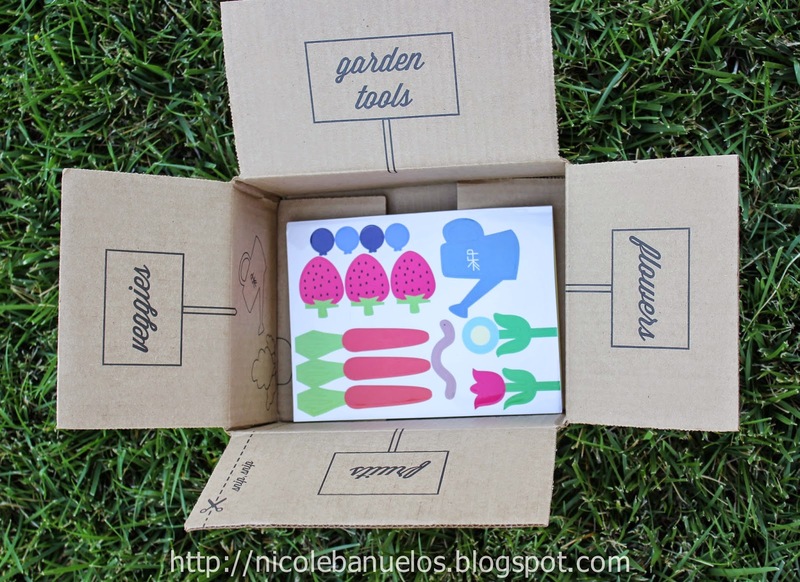 I absolutely love that Freshly Picked has turned their shipping boxes into a garden art craft for our little babes! They also provide stickers to make it that much more fun. I think this idea is so cool and even though Isabella might be too little now to understand I will definitely be saving the box for her to use as she gets a little older and interested in arts and crafts. Now Isabella is photobombed by our second dog, Princess! 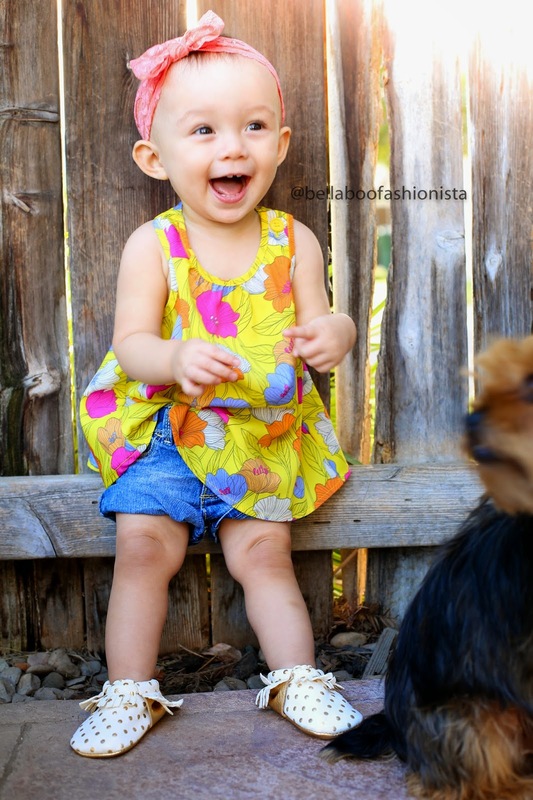 In these photos Isabella is seen wearing the “Radiant Orchard” Moccasins. They are so rich in color… I love them!! Here Isabella is wearing “Neon Pink” Moccasins. 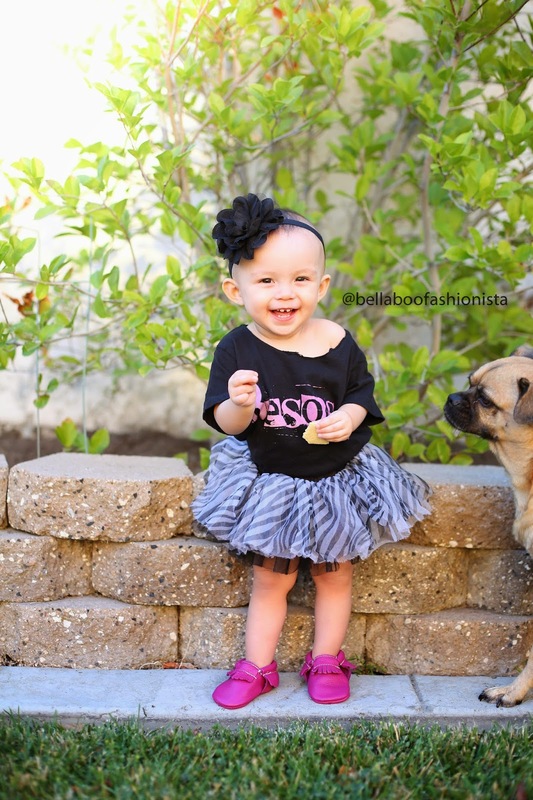 The name is not deceiving – these baby’s are super neon bright pink and as cute as can be! If you haven’t done it yet, go visit the Freshly Picked website and take a look at all the awesomeness happening over there!! I also encourage each of you to read about Susan’s journey in creating Freshly Picked. You can find a link to that page here. Her story is so moving and encouraging, even my hubby was impressed. I love Freshly Pocked moccs because if their high quality along with their fantastic color selection. They come packaged on a neat little bag. Thanks for the awesome giveaway on Instagram. I agree, Freshly Picked has the best color selection and are great quality! I just LOVE them! These moccs are my favorite sometimes I wish the price was different so I could buy so many pairs! They do look totally adorable on tiny baby/toddler feet! 🙂 Good luck to you, Chelsea! By far my favorite review of FP mocs!! Fingers crossed to get my girl a pair! Happiest of Birthdays to your little one!!! So excited for this opportunity! Thank you!! These have to be my favorite shoes ever.. When they can't be barefoot these are the best things! I would love a pair for my little princess!! These moccs are absolutely adorable! I wish I could get ones in every color ! Gahh so adorable on little feet! Happy birthday Bella Boo fashionista! ?